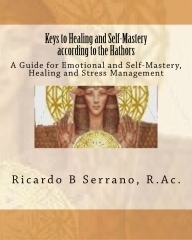 The goal of the fourth book Keys to Healing and Self-Mastery according to the Hathors, a supplementary book to Holographic Sound Healing taught at the Meditation and Qigong Mastery book, and the Omkabah Heart Lightbody Activation video, is to build the Ka and offer readers an effective Hathor’s emotional mastery technique to manage emotional stress, the main cause of disease, in their daily lives and spiritually awaken when emotional stress is cleared, released and stabilized. Doing this practice will provide a fast, safe way to stabilize your chaotic emotions such anger or fear. Holographic Sound Healing with the Four Sacred Elements is integrated with Ka(Merkaba) Meditation to complement Holographic Lightbody activation, and build the Sahhu or immortal golden lightbody. Dr. Johanna Budwig’s Diet for Cancer and Chronic Diseases and Sun Gazing are included as adjunct keys to healing. The Sahhu (also called “immortal golden lightbody”) I’m referring to is the ultimate goal of Taoist, Buddhist, Mayan, Shaivite, Egyptian internal alchemy practices, Qigong, Merkaba meditation, and the Hathor’s Holographic Sound Healing which will be your actualized crystalized replica after the so called “death” of the physical body. Is it possible to attain a Sahhu or immortal golden lightbody? A definite yes. However, you are the only one who can complete your whole body enlightenment and nobody else. All I or any healer/teacher can do is guide you, nevertheless, this most worthwhile work takes time and is its own reward because on a personal level it is the only thing you can take with you. You can’t take your money or your reputation or your kids or your house or anything. You can only take your essence. And if you have not integrated it you can’t even take the fragments of your essence with you at death. Until you integrate your essence into an immortal golden lightbody, you don’t even own yourself, you’re just a temporary composite of various spirits. Ultimately, I believe that once you have actualized your Sahhu or “immortal golden lightbody” and attained whole body enlightenment, your reincarnation cycle comes to an end. Lastly, the Hathors and ascended masters, and the powers of your Higher Self, the “soul body of your immortal golden lightbody,” in addition to ascension, whole body enlightenment and cosmic healing, can give you advice, protection, and guidance in your life. If you can, constantly feel the soul’s presence.Truth can only be known by EXPERIENCE, not by belief or thoughts.